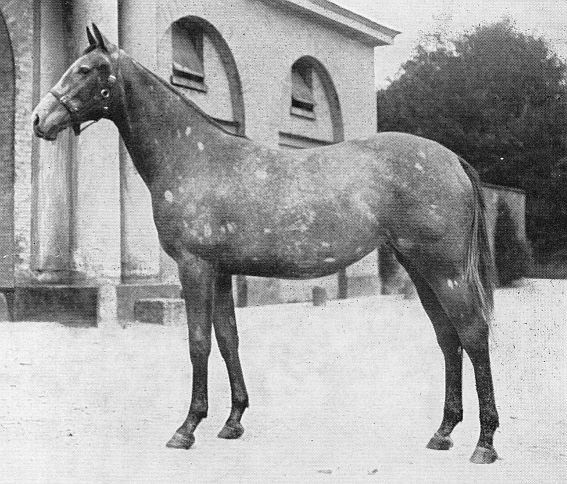 Mumtaz Mahal, a legendary broodmare and fantastic sprint racer is impossible to ignore--and her unusual spotted coat seems appropriate because she is a rare animal indeed. Blazingly fast, she was called the Flying Filly. Mumtaz Mahal is described as lightening fast, having faultless conformation, with quality, size and a good temperament. She was the champion two year in England, and many say she is the fastest filly of all times. She was bred by Lady Sykes and bought as a yearling by the Aga Khan. Mumtaz Mahal is at the head of his most successful family of winners. There is much more to this mare, since I first wrote this article in 2012, I have isolated the main bloodlines of the jumping trait, and this mare, besides all her other gifts is also a strong source of jump. And her sire and dam: The Tetrarch and Lady Josephine can themselves be relied on to produce jumpers. If you have sport success in your horses than you probably have Mumtaz Mahal or a close relative of her in your lineages. A product of two tightly bred parents: The Tetrarch--who is 3x3 to the full siblings Clementina/Tadcaster, and Lady Josephine who is 4x4 to the full siblings The Nun/Norfolk. This pattern is extremely potent--which her outstanding breeding career demonstrates. Even though the duplicated lines in her parents are stayers, not sprinters, concentrating them this close up will produce speed. The experts state that building up the far reaches of the pedigree does the opposite: produce stamina. And it looks like Mumtaz Mahal shows there is merit in this theory. In the breeding of sport horses we have all been told to avoid sprinting thoroughbred lines, that they are generally not good riding horse material. If there was ever a proof that this bias is foolish, we can see it here. Mumtaz Mahal is the dam of Badruddin, Mirza II, Rustom Mahal-who is dam of Abernant, Mah Mahal who inturn produced Mahmoud, and also Mah Iran, and Mumtaz Begum--who produced Nasrullah (the greastest overall sport line anywhere) and Sun Princess--the dam of Royal Charger. These are only some of her progeny, but these lines are interwoven into the modern race horse, and yes, the modern sport horse. In addition, her dam, Lady Josephine, is the dam of the fast and sound Fair Trial, and his sister Sansonnet who is the dam of Tudor Minstrel. This is a virtual who's who of important Thoroughbred bloodlines--all stemming from one mare and her mother. There is a hidden side to this story of her lineage. First, it is just a piece of good luck that her dam Lady Josephine was not born a year later. If she had been she would have been excluded from the General Stud Book! And of course if that happened then there would be no history writing English broodmare dynasty that influenced all of the racing and sport! Lady Josephine's dam-sire is Americus, an American Thoroughbred, who carried the bloodlines of Lexington RH who was sire of the full siblings The Nun/Norfolk who she was 2x2 to. Also the dam of those siblings, Novice, was by Glencoe, but out of Chloe Anderson, another American Running Horse. When the American sportsmen began bringing their racehorses and hunters over to England, Ireland and France to compete starting in the 1850s no one there was prepared for their far ranging success. By the 1880s the American horses had won just about all the classic races, many multiple times, and their offspring bred there were doing the same, including Americus Girl, the dam of Lady Josephine. The surprise at the performance level of these upsetters was quickly followed by uneasiness, then dread and anger, which finally resulted in the English Jockey Club passing an edict called the Jersey Act to put the American Thoroughbred out of business. Lady Josephine if born one year later would have been one of those excluded from the Stud Book. (See Legacy of Lexington for the full story on this episode and the reason why it was the American horses were so superior to their British counterparts). Take a look at her pedigree. Look at the duplications, and if you are familar with Thoroughbred lines you will notice that many of these repetitions are of known staying sources. For instance, Lexington RH, is an old pre-potent American line, a wildly successful racehorse and sire when race horses were expected to race four-mile heats, several times a day, this is after many of them had to ride ten to twenty miles to get to the races. It would be fair to say that Lexington RH is a source of stamina--he set world records for distance racing. Yet concentrating his lines close up has produced a source of speed. There are lessons in this pedigree that we may apply to our sport horse breeding programs. Mumtaz Mahal is not inbred herself. She is out of two inbred parents. Each side of the pedigree engages the background of the opposite side's inbreeding. This is why she was a top sprinter herself, she improved and intergrated the bloodlines of the parents. In addition, Mumtaz is a phenomenal broodmare, she and her sister are so prolific that they are considered part of the fabric of the modern Thoroughbred. She has the three daughter lines of the broodmare sire Hermit--a filly factor. The full siblings from her sire and dam provided strong filly-colt factor combinations. This is a beautiful pedigree--excellence for performance and for breeding. When building our sport horse lineages we want to try to have a pattern like this, not of course with sprinting lines, but with sport transmitters. When we have a horse that has good sport duplications close up, we will want to find a mate that connects to the background of that strength and/or provides an equally potent design in different beneficial bloodlines--like you see here. We find Mumtaz whereever great sport performance is found, and her grandson Nasrullah is rated #1 sport horse sireline in North America. Read more about these bloodlines in Legacy of Lexington --20% off when ordered from this site.